Doi Moi’s version of a doughnut takes a traditional Vietnamese drink and transforms it into an unconventional treat. For a new take on a staple Southeast Asian dish, head to Doi Moi in Logan Circle. The restaurant, located at 1800 14th St. NW, serves dishes inspired by Southeast Asian cuisine in a bright and chic space. The interior features white walls and ceilings accented by light wood benches and ornate tiling. While Doi Moi’s dinner menu features eclectic and delicious dishes that highlight countries like Thailand, Indonesia and Laos, the restaurant’s dessert menu makes Doi Moi stand out. The menu is filled with traditional Southeast Asian desserts – like khao neeo mamuang ($10), a mango sticky rice, and khao madt ($8), red bananas wrapped in coconut sticky rice and steamed in banana leaves – making it clear that Doi Moi has dessert mastered. The restaurant has rotating soft serve ($5) in flavors like coconut, fish sauce caramel and purple yam, and Doi Moi alters a convenience-store classic with its pandan ho ho ($10), a pandan chiffon cake rolled up with coconut frosting coated in white chocolate and topped with coconut flakes. Doi Moi’s version of a doughnut takes a traditional Vietnamese drink and transforms it into an unconventional but insanely delicious treat. It begins with a yeast-based doughnut that is light and fluffy. The doughnut is then stuffed with a sweet, rich Vietnamese iced coffee pastry cream. Due to the subtle sweetness of the actual pastry, the sweet cream is not overbearing but will still satisfy any sweet tooth. The taste of the pastry cream mimics the classic Vietnamese drink with a strong coffee taste and hints of condensed milk – a main ingredient of the drink. To finish it all off, the doughnut is sprinkled with granulated sugar, which is bruleed to create a thin, crunchy layer of sugar. This seemingly simple addition to the doughnut adds a crunch, making it stand out from a typical doughnut. If you need something savory after maxing out your sweet tooth, Doi Moi’s entree options are plentiful. Split family-style dishes among you and your friends like braised short rib jungle curry ($28) with Thai eggplant, basil and jasmine or sticky rice, or Rohan duck leg khao soi ($29), a dish made with turmeric, black paper, shallot and coconut milk broth that features a bone-in piece of duck meat braised in the broth and topped with egg noodles and pickled mustard greens. Doi Moi also offers plenty of cocktails to wash down your meal with, like the “5 o’clock somewhere” ($12), a Thai iced tea mule with vodka, Thai tea ginger beer and coconut milk, or the “Late Night Cindy” ($13), a classic negroni taken up a notch by a garnish of spiced orange. 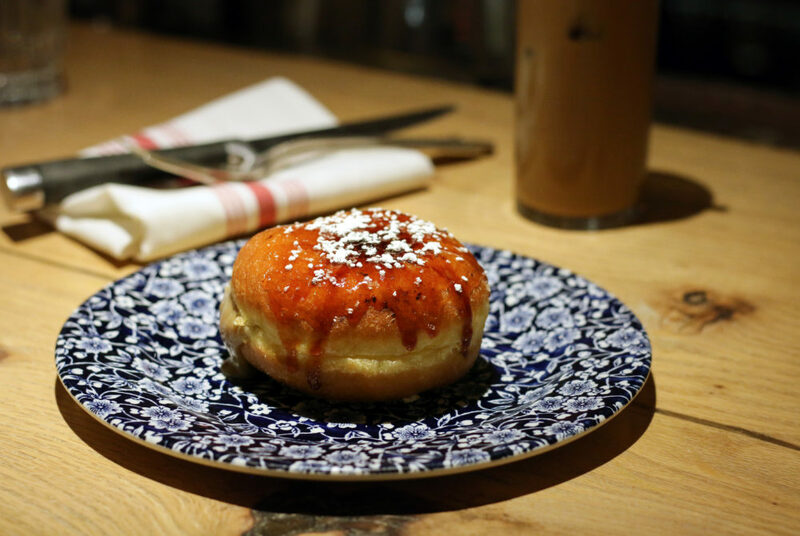 The next time you find yourself vying for a doughnut, skip out on chain coffee spots and head to 14th Street to experience a doughnut that is unlike any other in the city.